There are really two ferns in this category. 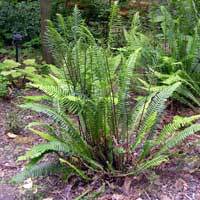 One looks a bit like a smaller sword fern, but this variety also produces a sterile frond which are like a single long, narrow, dark, glossy leaf with a wavy, crinkled edge along the length. THe stipe (stalk) is glossy black. 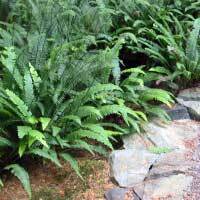 This frond is often called a deer's tongue fern. They like deep shade and some moisture. In the sun, they tend to be smaller. The more sun it receives, the more moisture it requires.